MUNICH, Sept. 14, 2011 — BMW made headlines last week when it announced that it would incorporate lasers into its headlights for the first time, starting with its new plug-in hybrid, the i8 Concept. The lasers, which are 1000 times more intense than conventional LEDs, are safe, the company said, and could result in significant fuel savings. BMW said laser light is "the next logical step" in the development of vehicle headlight technology and could become a reality in the next few years. For use in the US, such headlights would be considered a laser product and have to meet CFR21-1040 rules established by the FDA/Center for Devices and Radiological Health, said Ken Barat, laser safety officer at Lawrence Berkeley National Laboratory. "Diffuse laser light in many circumstances, even for a Class 4 laser, can be safe beyond limited distances," Barat said. "The question in my mind is: What is the actual lamp/laser configuration, and what steps are in place to have the system fail-safe?" Barat also voiced concerns about the safety of automotive technicians when testing or replacing the diode arrays. If the casing of one of the headlights were to break, the laser would safely switch itself off and pose no threat to automotive technicians, according to a spokesman at BMW. Cost to repair the light would be nearly the same as with normal LED headlights. 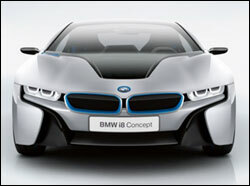 "Safety is a key consideration in the development of laser lighting for use in passenger cars," BMW said in a statement. The intensity of the laser light poses no possible risk to humans, animals or wildlife when used in car lighting, BMW said. This is because the original bluish light is not emitted directly, but is first converted using a fluorescent phosphor material into a pure white light that is suitable for use in road traffic. The BMW spokesman likened eye safety and the phophor conversion to available commercial products such as laser video projectors, CD and DVD players, and special medical equipment. Laser lights are more efficient than LEDs, generating approximately 170 lumens per watt, compared with about 100 for LED lights. Lasers also consume less than half the energy of LEDs, which would save on power consumption and, in turn, fuel costs. With a length of 10 µm, laser diodes are even smaller than the small, square-shaped cells used in conventional LED lighting, which have a side length of 1 mm. This opens up new possibilities when integrating the light source into a vehicle and could theoretically reduce the size of the headlights, although BMW engineers currently have no plans to do that. Instead, they will focus on altering headlight positioning and body styling. In the future, it may be possible to use laser light in other vehicle lighting functions, such as adaptive headlights (headlights that move with the car), the "dynamic light spot" system that illuminates pedestrians and the "anti-dazzle high-beam assist" that reduces glare from high beams for oncoming traffic. The company expects the first application in series production cars within three to five years time. For more information, visit: www.bmwgroup.com. Aside from changing my headlights, thanks to http://originalwheel.com/ for i was able to change rims on a reasonable price. Remember the April Fool's ad a long ways back where Beemer introduced their snow melting CO2 lasers? How absurdly funny yet awesome in imagination. Given my experience with the newer halogen lamps this development concerns me. Halogens obviously meet current requirements, but to oncoming traffic they are visually worse (because of the color?) than even high beams from conventional lamps. Maybe it helps people with poor night vision, but they are blinding the rest of us.